Full disclosure: I’m not much of a basketball fan. Truth be told, I piece together the rules of the game as I watch, and sometimes it feels like I’m learning another language. I’ll admit, I’m a sucker for the jargon: “in the paint,” “field-goals” and “from downtown” are irresistible phrases, but I haven’t mastered all their meanings. What I can appreciate, just as much as anyone else, is the power of a communal passion that brings together thousands of people from across the country, to dress in the same colors, to shout as one and jump to their feet in unison. That’s a sight to behold, and for an outsider like me, it can be even more interesting than the basketball. Alerding knows a thing or two about being a fan. He’s followed Xavier basketball for the better part of half a century, and the success of each season is framed by that broad context. “I think it’s doable,” Alerding said about Friday’s game. “We have to play an exceptionally good game and Baylor will have to be off a bit.” The prediction was sound. Xavier’s game was less than exceptional, and Baylor’s wasn’t off a smidge. But win or lose, Alerding’s support of Xavier is unwavering. “We never would’ve dreamed when we were in school that we would have such success,” he says. “We’ve suffered through the bad years and this is the payoff.”Alerding and his buddies endured losing season after losing season for the Musketeers, in the Schmidt Fieldhouse and Cincinnati Gardens. So the new success is an earned pleasure. His friend, Dan O’Malia ’69, has stuck with the team, too. “Between 1968 and 1982, we lost 100 games more than we won, and some to D2 schools,” he says. “To watch the thing climb has just been incredible.” O’Malia would know. He’s been to every Xavier NCAA playoff game–with one exception when he was in eighth grade–and he can tell you the score of each of them, too. Friday (70-75) was his 45th playoff game. 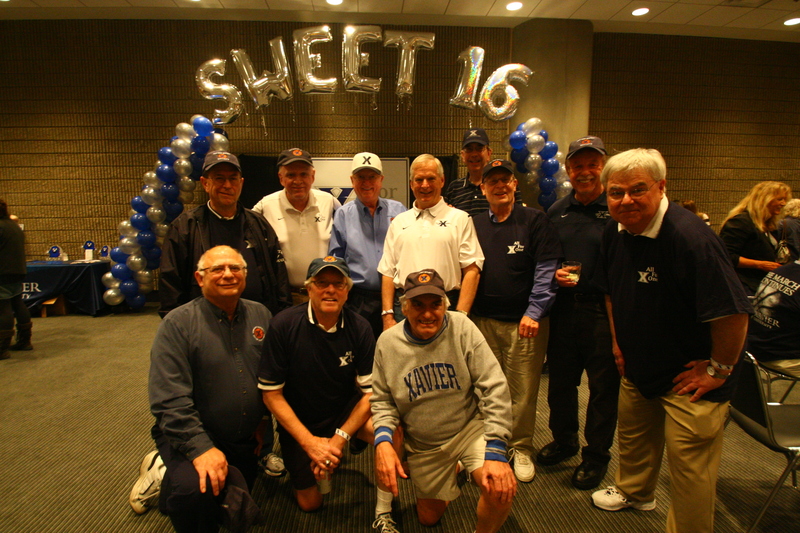 Members of the Lew Hirt Society--an elite club of fanatical fans--gather in Atlanta before Xavier's Sweet Sixteen game on Friday. The Musketeers lost the game, but will never lose these fans. Jim Alerding '67 is third from the right, standing, and Dan O'Malia '69 is kneeling in the center. Equally aware of his role is Matthew Westgate, director of Xavier’s pep band. At the reception he’s wearing a blue and white wig that he picked up in Atlanta. His students have been practicing just as long as the basketball team has and they’re ready to put on a memorable show. “This is what they wait for all year,” Westgate says. “This is our Sweet 16, too.” It’s great to see Xavier in the national spotlight, he adds. Indeed, the exposure produces measurable results for Xavier. Xavier's cheerleaders put a spark in the crowd at an alumni reception before last Friday's game in Atlanta. Like the basketball team, they've been practicing all year. Win or lose, Xavier fans like Alerding aren’t going anywhere. He’s supported the team for almost 50 years now, and long ago it became part of his identity. How many more Alerdings were in the crowd Friday night, dressed in blue and white, swirling towels and shouting toward the court as if the volume of their voices would carry their team to victory? Every seat in the Georgia Dome was occupied by an individual Friday night, but for 40 minutes, they saw, moved and spoke as one–the Xavier tribe. They’ll be back again next year for another season and, happily for basketball novices like me, new members are always welcome. An overcast morning here in Atlanta, clouds circling around the skyscrapers, promising rain. Fans are trickling into the city, and down at the Russell apparel booth in the lobby of the Hilton, Xavier and University of Kentucky gear is out-selling all the other teams. 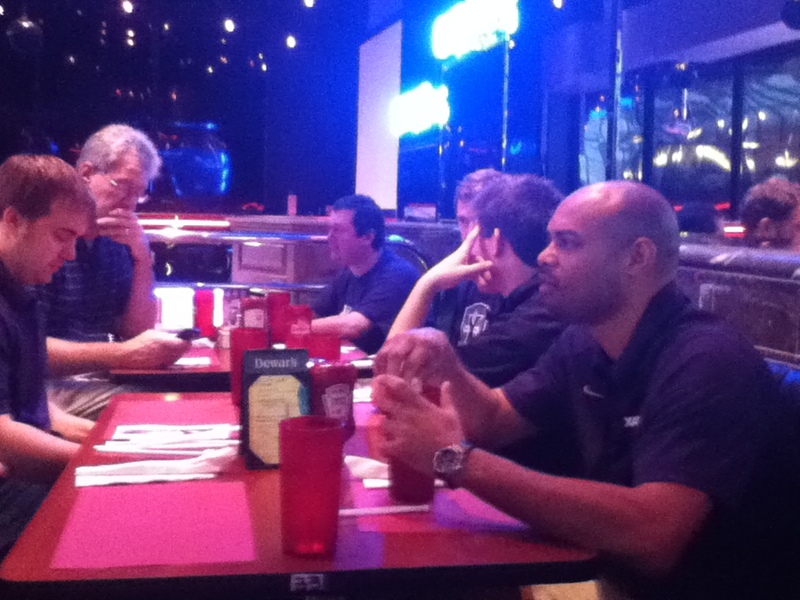 For breakfast, we met up with Xavier’s all-time leading scorer Byron Larkin and fellow Hall of Famer Joe Sunderman, the Musketeers’ longtime radio announcing team, at the Metro Cafe Diner, a night-club by night and a diner all day long. It’s a neon-lit joint, all carpet and chrome with mirrors that drop from the ceiling to the floor. Atlanta's Metro Cafe Diner offers southern breakfasts all day long. This morning it served up Byron Larkin, Joe Sunderman and a gaggle of Xavier hangers-on. Sunderman is carrying a list of about 10 names and numbers of the Baylor team, which he has written out in different colors and is committing to memory. Baylor is a worthy opponent, Sunderman admits, with a talented point guard in Pierre Jackson, a deadly 3-point shooter in Brady Heslip and giant rebounders under the basket. “All of them can jump out of the gym,” he says. But does he have a forecast for tonight’s game? Sunderman’s son, Joe Jr. is also at the breakfast table. He points out a recent USA Today article he read that says teams shoot 3-pointers with six percent less accuracy when playing in a dome. “That’s what I’m banking on,” he says. Larkin’s tips for Xavier are to keep Baylor off the boards, don’t turn the ball over and to recognize Baylor’s changing zone defense. Xavier’s older team and NCAA experience will help, he says. Larkin and Sunderman have been studying Baylor’s team for the past week. Larkin has been watching their games on ESPN3.com, and Sunderman has been poring over game notes and the 17-inch sheets of paper he writes out with all the players’ statistics. Sunderman, Larkin and their producer, Russ Jackson, will spend some time later today rehearsing the opening to the game. 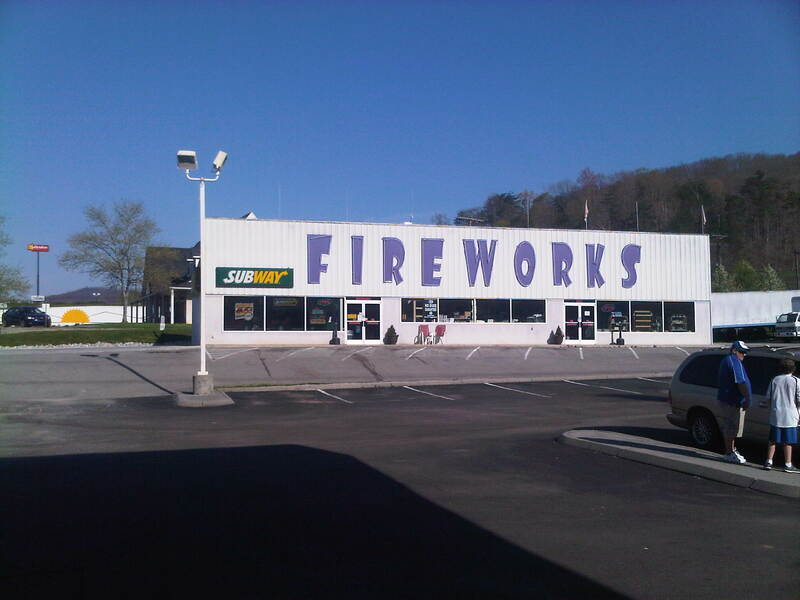 Then it’s just a matter of waiting for the fireworks. Does Larkin have a forecast for the game? Back in the Hilton, the team hotel, I meet Tu Holloway in the elevator. In the few seconds between floors, I ask if he’s looking forward to the game tonight. “I’m really excited,” he says. His game face is on and he looks ready. Ever wonder how sports teams get their victory apparel just seconds after the game? Susan Griffin, director of the Xavier Bookstore, has the answer in four words: “hot market item vendors.” She’s sitting in her office on a warm spring afternoon, minutes after the basketball team left for Atlanta, and she’s surrounded by overflowing boxes of Xavier gear. A pair of pink plaid Xavier pyjama bottoms hang from a bookshelf next to three Xavier garden gnomes to be saved, a note says, for John Hensley. 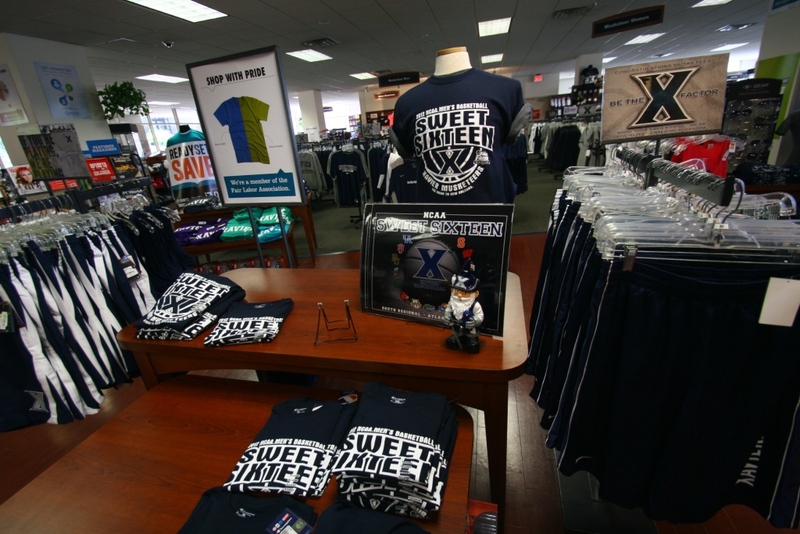 Xavier's Sweet Sixteen T-shirts are flying off the shelves at the campus Bookstore, but more shipments are due to arrive on Thursday and Friday. Hundreds of the Sweet Sixteen shirts were flying off the shelves at the Bookstore Wednesday afternoon. “That’s why we’re here,” says Chris Geiger, a 1974 MBA graduate and season ticket holder since the Schmidt Fieldhouse days. Geiger is picking up a shirt with his 15-year-old son Alex to wear on Friday. There aren’t many sizes left to choose from. Smalls have gone fast this year, Griffin says, but two more shipments on Thursday and Friday will replenish the stocks. In the meantime, Griffin is packing up boxes of shirts, pom poms, spirit beads, hats and other items to drive down to Atlanta on Thursday. She’ll have the Xavier gear on hand to sell at the pre-game alumni event. Joining Griffin on the journey down south will be D’Artagnome, the footloose gnome whose adventures are ably chronicled on the Bookstore’s Facebook page. 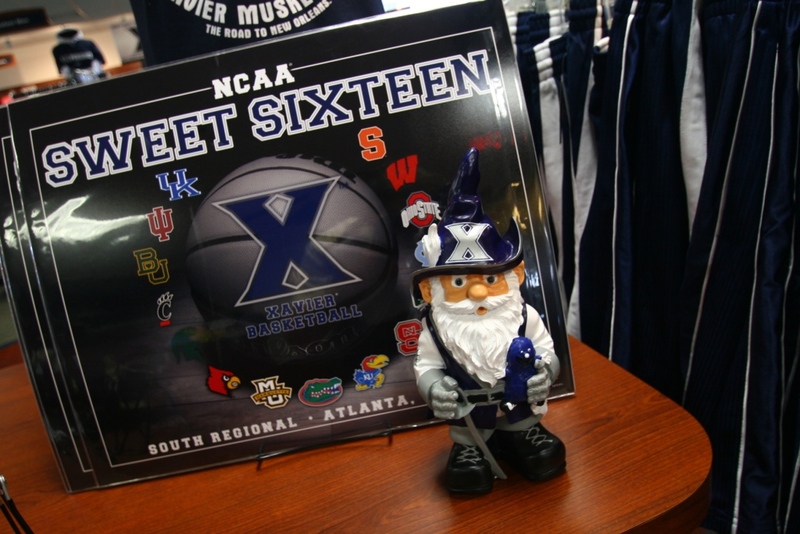 D'Artagnome will be making the trip down to Atlanta to take in the Sweet Sixteen spectacles. This is a significant journey for a creature with such small legs. 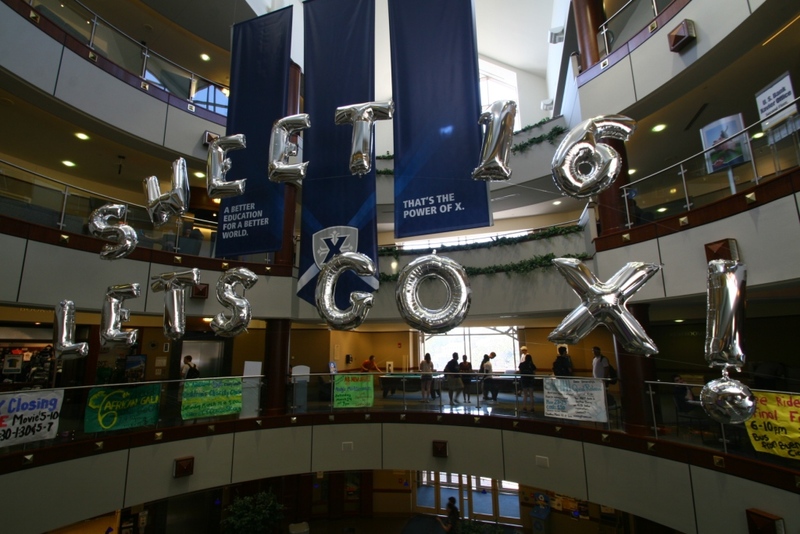 Balloons spell out the campus spirit on Wednesday afternoon in the Gallagher Student Center's atrium. Xavier takes on Baylor at 7:15 p.m. Friday night in Atlanta. D’Artagnan was dancing. The cymbals were clashing. The pom poms were pomming. 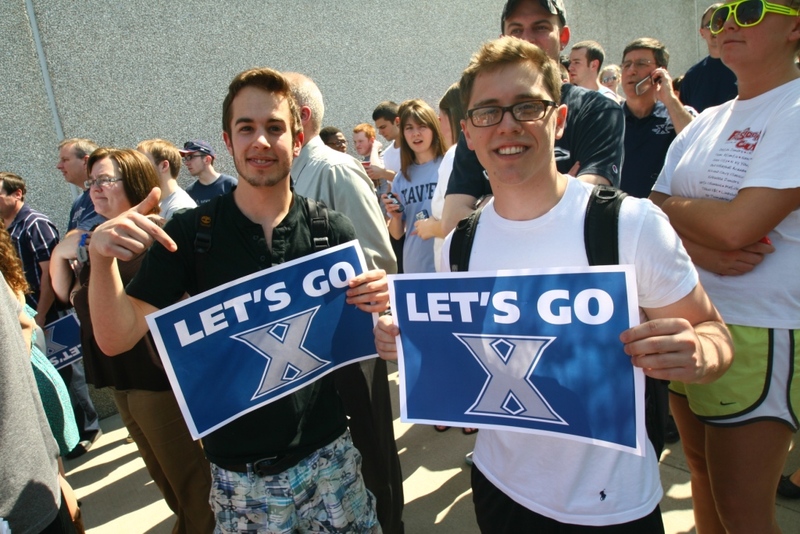 The pep band was playing Taio Cruz.That was the scene outside the Cintas Center at 2:00 p.m. today as students, faculty and alumni sent off the Xavier Musketeers to their fourth Sweet Sixteen appearance in five years. As two buses with tinted windows idled curbside, Xavier cheerleaders flung t-shirts, mini basketballs and sunglasses into the swelling crowd. Among the throng were juniors Arthur Havey and Zach Boothe, grandson of the estimable Jim Boothe, the Xavier Hall of Famer and 1,000 Point Club member from the mid-1950s. “Unfortunately none of the talent transferred to my dad or me,” Zach says. Zach Boothe (left) and friend Arthur Havey cheer on the team as they depart for Atlanta. Boothe's grandfather is Xavier Hall of Famer, Jim Boothe. “It’s going to be a really hard game,” says Havey. “Baylor’s a good team.” The pair will watch the game with friends at their house, just off campus. “Wayland (Street) goes nuts when Xavier wins,” Havey says. “The cops came last time. They’re like, ‘Settle down.’ We’re like, ‘We’re in the Sweet 16, we can’t settle down! '”Finally the Cintas doors open, and out walk Kenny Frease (in yellow shades), Jeff Robinson, Brad Redford, Andre Walker and the rest of the team. They shake hands with Fr. Graham, hug Sister Rose Ann and throw out shirts to the sea of waving arms. Xavier’s very own Pope Man (Bill Strietmann, ’77) is on hand with his Pope Mobile, and signs: “Xavier Pope Man is Stoked,” one reads. 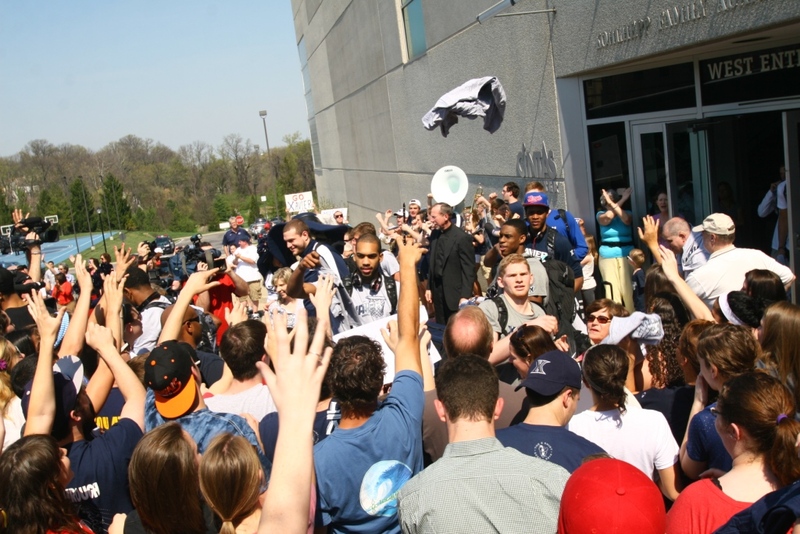 Brad Redford launches a T-shirt into a crowd of fans as the Musketeers depart the Cintas Center for their Sweet Sixteen match-up against Baylor in Atlanta on Friday. When all the shirts are thrown and the luggage is stowed, the team steps aboard and heads off to the airport, where their chartered plane awaits on the tarmac. (Thanks All For One club!) Wiping sweat from their brows, the crowd disperses, thoughts drifting south to Atlanta, where almost 48 hours from now, the Musketeers will take the court to vie for their place among the country’s Elite Eight. Stay tuned to this blog for more behind the scenes coverage from Atlanta. Xavier is off to Atlanta to play Baylor for its fourth NCAA Sweet 16 appearance in five years. The men’s basketball team is leaving for the Sweet 16 of the NCAA tournament tomorrow afternoon, Wednesday, March 21, at 2:00 p.m. from the west entrance of Cintas Center. This is the fourth time in five years that Xavier has made the Sweet 16. The Musketeers face Baylor at 7:15 p.m. Friday, March 23, at the Georgia Dome in Atlanta. The game will be aired on CBS TV.